Emotions, Technology, and Social Media discusses the ways the social media sphere uses emotion and technology, and how each of these has become part of the digital culture. The book explores this expression within a psychological theoretical framework, addressing feelings about social media, and its role in education and knowledge generation. The second section investigates the expression of feelings within social media spaces, while subsequent sections adopt a paradigm of active audience consumption to use social media to express feelings and maintain social connectivity. 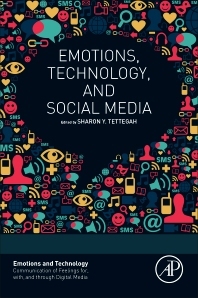 Sharon Tettegah is a Professor in the Department of Teaching and Learning at the University of Nevada, Las Vegas and Former Program Chair of Digital Environments for Learning, Teaching and Agency in the College of Education, at the University of Illinois, at Urbana Champaign. She has an appointment in the Cognitive Neuroscience in Bio-Intelligence at the Beckman Institute for Advanced Science and Technology. In addition, she is a Research Scientist and affiliate at the National Center for Supercomputing Applications (NCSA). Her research centers on the intersection of STEM learning, Emotions, Equity and Social justice. She was also a Program Director in 2010-2012 at the National Science Foundation where she managed five programs in the Directorates of Education and Human Resources, Computer and Information Science and Engineering and including a NSF cross-cutting program on Science, Engineering, Education for Sustainability (SEES). She is also the Series Editor for Emotions and Technology with Elsevier, Academic Psychology Division.